The head and shoulders and ensuing death cross is depicted in the graph below (graph courtesy of StockCharts.com). Now, it’s fair to point out that technicians also consider a failed head-and-shoulders — one that does not fully “pierce the neckline” — a strong bullish signal. 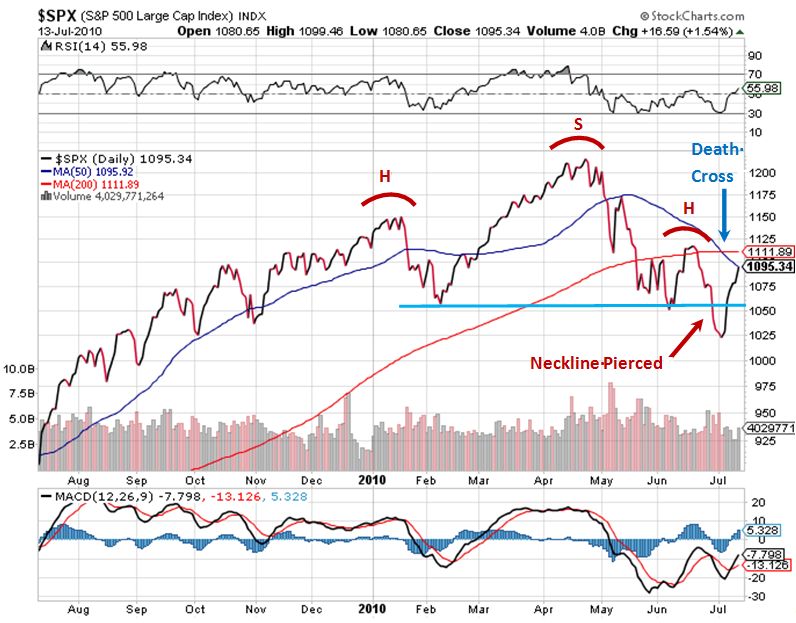 But, as the chart shows, the neckline was clearly pierced, and closely followed by the death cross. Most investors have longer memories than that. I know I would enjoy reading a thorough analysis of the market factors that contributed to this widely-publicized head-and-shoulders/dark cross pattern leading to a 5% market rebound. I hope someone among the more technically-minded among us will write about this in the next few days and forward the link to me. Also, the reliability of a head-and-shoulders pattern is somewhere in the neighborhood of 50% (not worth getting all worked up about).